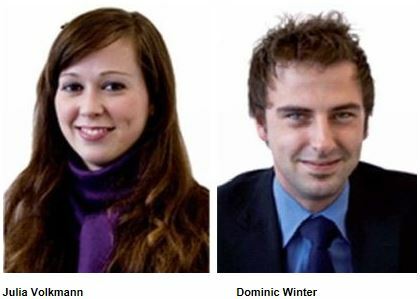 It has now been exac­t­ly three years sin­ce Julia Volk­mann (24, from Lan­gen­feld) and Domi­nic Win­ter (27, Lan­gen­feld) both star­ted their trai­ning as mer­chants in who­le­sa­le and for­eign tra­ding on 01.08.2007 with SILAG Han­del AG. Sin­ce then they have suc­cess­ful­ly com­ple­ted their cour­ses: Julia in Febru­a­ry this year – it was pos­si­ble to shor­ten her trai­ning peri­od from the regu­lar three years to two and a half – and Domi­nic has just pas­sed his last exam suc­cess­ful­ly. SILAG Han­del AG congra­tu­la­tes them both on their suc­cess­ful cour­se com­ple­ti­on and is proud to wel­co­me them anew as employees of the com­pa­ny. Loo­king back, both con­firm having had an exci­ting, inten­si­ve and enjoy­a­ble time that was multi‐faceted and very inst­ruc­tive. They were able to make the most of out­stan­ding per­so­nal deve­lop­ment oppor­tu­nities, being pre­sen­ted with spe­ci­fic and deman­ding chal­len­ges and invol­ve­ment in multi‐faceted pro­jec­ts across many dif­fe­rent busi­ness sec­tors. In con­clu­si­on then, an abso­lute­ly posi­ti­ve bot­tom line with signal effect. This is a sure sign that, SILAG Han­del AG, which is also cele­bra­ting its 25th anni­ver­s­a­ry this year, has not just pro­ven its­elf to be a reli­able employ­er but that it also meets its soci­al and com­mu­ni­ty respon­si­bi­li­ties in rela­ti­on to the site and in par­ti­cu­lar to the trai­nees as a com­pa­ny that leads and gui­des in an exem­pla­ry, sustainab­le and future‐orientated man­ner.